Get the best service and rates by dealing direct with Fitzroy Island Resort. Resort Studio Rooms - Air conditioned rooms with ceiling fan, plasma TV, en-suite black marble tiled bathroom, tea and coffee facilities, bar fridge. Rooms are 32sqm and are suitable for Twin or Queen size bedding and have limited rainforest views. Set amongst the rainforest and moments from the beach our Butterfly Bungalows offer a secluded island hideaway option for couples, families or groups of friends. Perfect for a true Aussie getaway! Each stand-alone bungalow offers bedding for maximum of 2 adults and up to 3 children, with a queen bed, bunk beds and a fold out bed suitable for a young child. Features include a small internal food preparation area with a mini bar fridge, microwave, kettle and toaster, plus a covered outdoor deck area with tables and chairs, large Esky and Webber BBQ. 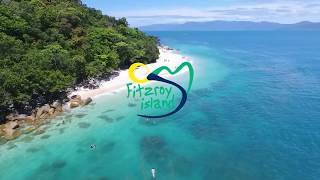 A 45 minute Fitzroy Flyer ride will get you from Cairns to Fitzroy Island and back daily, perfect for day trips to visit the Great Barrier Reef. The Fitzroy Flyer will also get you there and back again when you’re heading to the island for a longer holiday too. All Fitzroy Flyer services depart from Cairns Marlin Wharf-Berth 20. Please check updates as schedules and prices may change for the above. Arrive at the wharf 30 minutes before departure for check-in. Locals: We are pleased to offer locals 20% off return transfers. A current Cairns drivers license/ID must be shown on arrival at reception or the full rate will apply. Locals are people who live up to 150km from Cairns CBD. No cancellations or amendments permitted. Not valid over the Christmas/New Year period – 21st December to 10th January. Treat your loved one to a private beachfront dinner on Fitzroy Island, only 45 minutes from Cairns. Our private beachfront dining makes for an unforgettable evening of romance - perfect for a proposal or celebration! Get introduced to the beauty of Fitzroy Island with our ‘Taste of Fitzroy Island’ package from $195 including breakfast and transfers. - Valid for stays until 31st May. Excludes 19th – 28th April 2019. - Non refundable/no changes permitted. - Additional nights $64.50 per person including breakfast. Fitzroy Island is a rare unspoilt gem, nestled just 29km from Cairns in beautiful Tropical North Queensland. Fringed by Australia's outstanding Great Barrier Reef and graced by majestic world heritage rainforests, this unique island oasis literally is where the rainforest meets the reef. On the island you will find Fitzroy Island Resort, an affordable 4 star resort providing a perfect place to relax and indulge. Foxy's Bar offers live music most weekends, enjoy that cool drink while overlooking the Great Barrier Reef. For the nature lover the island also has a camp ground. 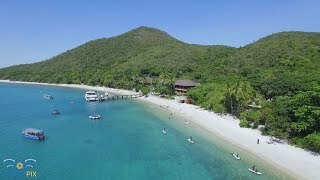 Fitzroy Island Resort is a newly developed, world class resort carefully designed to complement the spectacular natural setting of this Great Barrier Reef island while truly indulging resort guests. 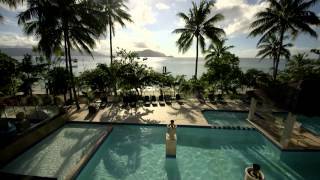 Fitzroy Island Resort exudes luxury and elegance, island-style. It's stylish, modern and sophisticated with all the features you'd expect of a modern resort. Yet at Fitzroy Island Resort, it's a more natural tropical sophistication that suits the island paradise on which it was created. Surrounded on one side by majestic rainforest and on the other by vast expanses of crystal clear ocean, the location demanded something special. And so the resort has been carved with warm timbers, natural stone, elegant water features and mood lighting combining with simple architectural lines to create a resort that integrates seamlessly within the natural environment. The result is a magnificent yet serene oasis where day guests and longer stay visitors can relax, unwind and be indulged within the privacy of this amazing Great Barrier Reef island. Luxuriously boutique appointed beachfront Cabins just a stones throw from the water's edge, each featuring 2 bedroms one with a king bed and two king singles, ideal for familes with young children or a romantic getaway for 2! These luxury apartments are set over 65sqm with large master bedrooms and private balconies overlooking the crystal clear waters that surround Fitzroy Island. Our apartments are equipped with large queen-size master bedrooms, a spacious lounge area, separate bath and shower, and private balcony, and are ideally located parallel to the beachfront. Just a cluster of tropical palms shade your view of the magnificent ocean. Luxury appointed air-conditioned rooms include plasma TV, ensuite black marble tiled bathroom, tea and coffee facilities, small fridge. Choice of King bed or 2 single beds. Fitzroy Island’s camp ground provides generously spaced camp sites just 20 meters from the coral beach. 250 meters away is Fitzroy Island Resort offering tantalizing refreshments or Foxy’s Bar where you can enjoy live music by local artists most weekends. The campground includes showers, toilets and BBQ facilities, as well as picnic tables. The Cairns Bluewater Fishing Competition was a huge success! The tournament attracted anglers from local, national and overseas regions. What a great atmosphere! Blessing and Dawn Service from the Australian Navy, performance of the NZ Maori Haka from TeFenua. Thankyou Fitzroy Island Resort Staff and Queensland National Parks for maintaining a excellent world class environment to wind down and relax. The accommodation was comfortable, accessible, clean, with all the comfort features I expected. The coral beaches, the historical lighthouse, and walking tracks were challenging and rewarding. I did venture out after 2am this morning only to chat with the local wildlife at the main entrance: a beautiful tree snake. Harmlessly enjoying the garden. There were heaps of activities to do and the cost of hire wasn't overwhelming. My boyfriend and I stayed at Fitzroy Island for 6 nights, in this time we made the most of our holiday by relaxing in the pool having beverages from the swim up bar, hiring out kayaks and paddle boards that gave us the opportunity to see wild sea turtles, snorkelling, walking up to the lighthouse and the summit for an amazing view, watching the sunset everyday from Foxy's bar and we also had a tour of the on sight turtle rehabilitation centre. In this time we found all staff to be lovely and energetic in particular the bar staff were always smiling and asking us about our day and what we were planning next and the turtle rehab tour guide was passionate and informative. Overall it was an unforgettable place to visit and we didn't want to leave! Fitzroy Island is located approx. 35 kilometres (18 nautical miles) south east of Cairns. A ferry ride from the Cairns marina takes approximately 45 minutes.